Sam Cade is founder and owner of custom cake business Cades Cakes. Having always been creative with a sweet tooth, bakeries were the natural first choice when looking for jobs. Realizing her dessert passion was more than just a hobby early on, she switched from business school in Austin to Pastry School in NYC. 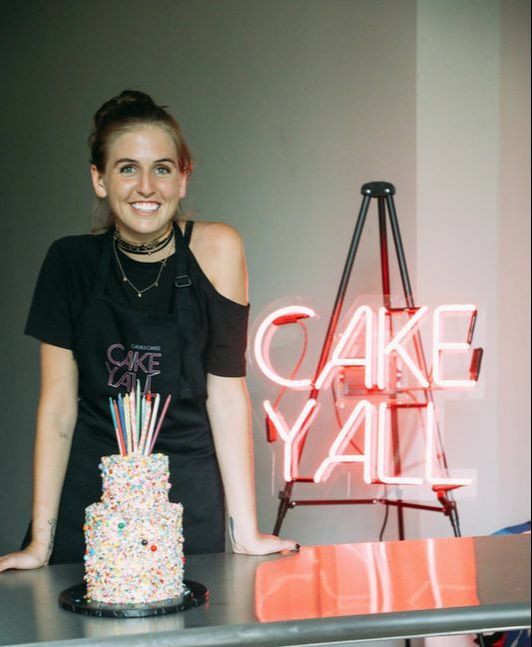 After graduating from the Pastry Program at the International Culinary Center in 2014, she worked at Momofuku Milk Bar before, returning to her love of solely custom cakes in Dallas, Texas. Known for her unique cake shapes and crazy customer cake requests. Daily cake can range from an oyster platter to a pair of Yeezys to a hand painted sugar skull. Inspired by art, fashion and culture no two cakes or days in the bakery are the same. She’s excited to introduce cool custom cakes. We only open 2 months at a time to limit order changes and maintain emails. We recommend ordering as soon as order forms go live. Keep in mind weekends fill up faster than weekdays. Submit a cake order form, its non committal. It just asks the basics and we will get back to you as soon as we can. DO YOU HAVE CAKES FOR PICKUP TODAY? No we do not have extra cakes. We are currently just making cakes for custom orders only. NYC! East Village address given upon order confirmation. Yes we do offer gluten free cakes. However, we are not a gluten free bakery and we do not recommend ordering if it is a severe allergy. CAN YOU DO A CUSTOM FLAVORED CAKE? Most likely. Email us your flavor idea and we’ll let you know if we can accommodate. Keep cake refrigerated until 1 hour prior to serving. If driving to a destination, keep in the fridge until the drive. WHAT DO I WITH MY LEFTOVERS? Cake will stay fresh for up to 3 days refrigerated, or up to 2 weeks wrapped in freezer. CAN I FREEZE MY ENTIRE CAKE AND EAT IT LATER? No we do not recommend freezing cakes in order to maintain a high quality of design and taste.